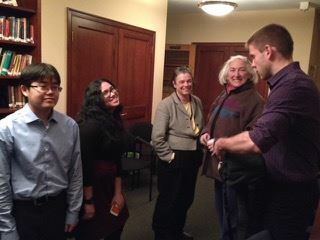 Students from The George Washington University's CyberCorp Program gave a presentation on Cybersecurity to 15 Villagers on Wednesday evening, Feb. 11. Topics including how to protect your computer from malware, when not to use public Wi-Fi networks and browser threats were covered. Presenters Jackson Reed, Janice Rosado, and Jordan Takayama are all master’s degree students in GW's "Partnership in Securing Cyberspace through Education and Service" (PISCES) program. Federal funding provides scholarships for students to study Cybersecurity at GW for up to three years. After completing their coursework, these students will help protect the nation's information infrastructure by working as security experts in a government agency.